Slice tomatoes and place in large shallow pan. Sprinkle with salt and pepper, drizzle with 1 tablespoon of olive oil and toss a few sprigs of fresh rosemary over tomatoes. Roast tomatoes 30-40 minutes. While tomatoes are roasting, season both sides of chicken with first 3 ingredients. Heat a large ovenproof skillet over medium high heat and add equal amounts of olive oil and butter. Once the butter has melted into the olive oil, add the chicken breasts to the pan, cook in batches to make sure not to over crowd. Cook on each side until lightly browned, about 3-4 minutes each. Brush 1-2 tablespoons of pesto over each chicken breast. 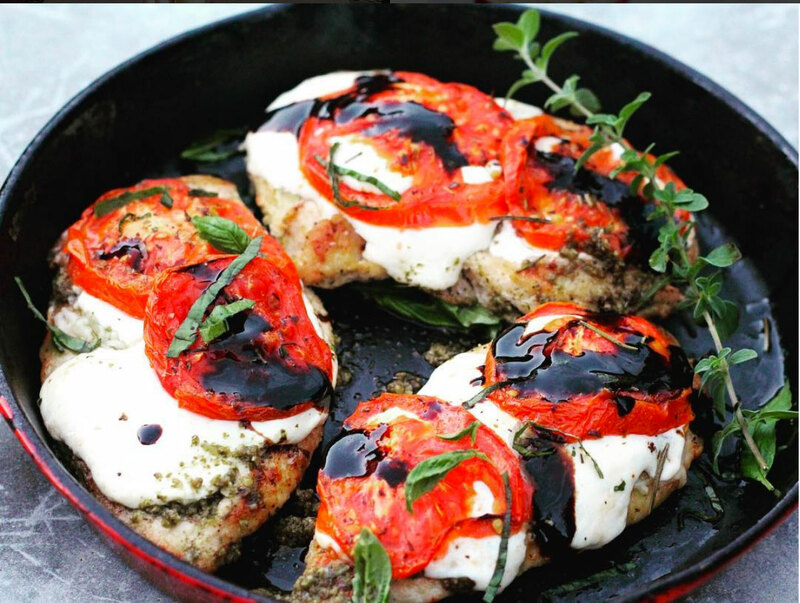 Top each chicken breast with a slice of mozzarella and a few slices of tomato. Put the skillet in the oven and cook for 10-12 minutes or until the chicken reaches an internal temperature of 165 degrees. F.
Remove from the oven and garnish with fresh basil and a drizzle of balsamic glaze.